Legal scholar Jedediah Purdy talks about Brett Kavanaugh, the Supreme Court’s looming crisis of legitimacy, and how the Left can take advantage of that crisis. Last week, Supreme Court nominee Brett Kavanaugh defended himself before the Senate against allegations of sexual abuse. This week an FBI investigation is underway to uncover the truth about his past behavior amid the tangle of lies the judge has woven. Meanwhile, thousands of activists are blocking the streets and occupying offices to demand that Kavanaugh’s confirmation be rejected. Jacobin staff writer Meagan Day sat down with Jedediah Purdy, left-wing legal scholar and professor of law at Duke University, to discuss the effect of the Kavanaugh crisis on the American popular conception of politics in the courts. The Kavanaugh proceedings are saturated with “legitimating discourse around constitutional jurisprudence,” says Purdy, “which holds it up to be something ideally neutral and transcendent, which is compromised whenever politics is injected into it.” We should push back on that, he argues, fostering instead the recognition that “the courts are political, and that fights over the basic direction of institutions and the distribution of power in the country will always tend to involve the courts.” Only then can we begin to see how the courts might fit into the Left’s political struggle to build a better world. Let’s start by talking about what’s at stake with Kavanaugh. 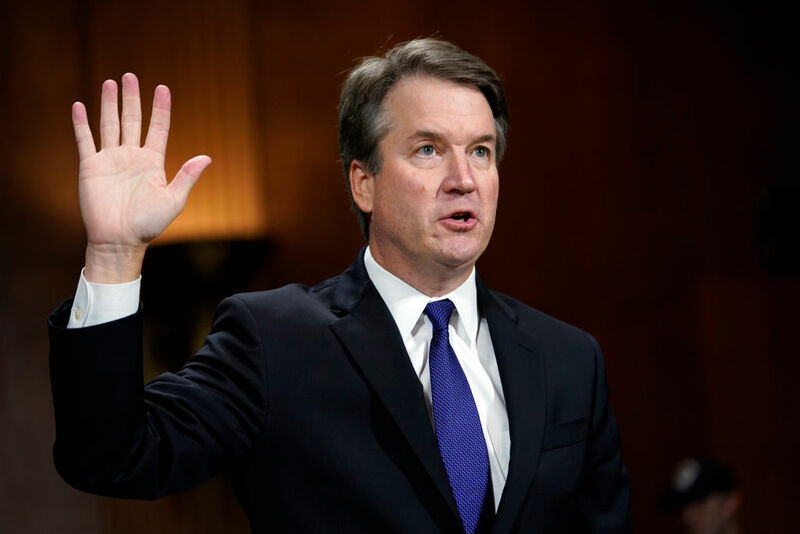 What kinds of decisions will he be in charge of if he’s confirmed to the Supreme Court, what kinds of political commitments will guide him, and what are some possible ramifications? I’m not a student of Kavanaugh’s jurisprudence in particular, but he’s uniformly recognized as a product of the Federalist Society’s multi-decade project to cultivate a set of conservative jurists, and he’s been one of the crown princes of that movement and network for a long time. Things that might happen if he had the controlling vote on the court would include very solid entrenchment of the basically unlimited protection of money in politics as political speech, and possibly its expansion to protect things like unlimited direct donations to campaigns. I would expect an extension of the use of the free speech doctrine generally as a deregulatory instrument, to bring down things like mandatory disclosure or restrictions on transfers of data, or in industries like banking where transparency may be a big part of regulation. Generally, the First Amendment has turned into the same kind of free-roaming tool of judicial deregulation that the “freedom of contract” in the due process clause was in the late nineteenth and early twentieth century. That would likely keep happening. So those are very big in terms of the balance of power between organized money, concentrated wealth on the one hand, and votes or other forms of social and political organization on the other. Following in that vein, you could potentially see an extension of the libertarian anti-union doctrine, the constitutionalization of the right-to-work doctrine that we saw in the Janus case extended in some fashion to non-public-sector unions. You could see invalidation of any effort to deal with climate change that doesn’t come out of brand-new legislation. Trying to do climate change regulation on the strength of the Clean Air Act alone could easily fail. And even if Roe v. Wade were not formally overturned, it seems likely that you would not see many abortion restrictions invalidated. Additionally, it might very well be that a colorblind theory of constitutional equality would knock out all race-conscious policies, like affirmative action at public universities — which would possibly by extension make it much harder to do in private universities. So, those are some of the stakes off the bat. I would say also that any thought about a progressive use of the courts, to push back against voter suppression for instance, would be dead for a couple of decades barring unexpected contingencies. Those are high stakes! And yet we have frustratingly little say over the outcome here. The Supreme Court ends up making all these key policy decisions, but we don’t elect justices. Instead we elect the president who nominates the justices — but of course this president didn’t win the popular vote. And we elect the senators who confirm the justices — but residents of sparsely populated Midwest and mountain states have disproportionate representation on the Senate. Is part of people’s anger about Kavanaugh coming from an intuitive understanding that this process is undemocratic, and that they have no real input over whether this guy serves on the highest court in the nation for the rest of his life? My sense, like yours, is to start with aspects of the emotional response. A lot of people are looking at this and saying, where is this guy coming from? Who put him in this position? Who are these gerontocrats, these dinosaurs from Iowa who are asking Christine Blasey Ford all these questions and then teeing up questions for Kavanaugh about his belief in God? Why is the question of whether sexual assault is really not okay still a live question? People are looking at this world that is so alien and alienating, and that world is making the decisions. And then if you peel back the constitutional structure that generates that situation, you get a whole series of counter-democratic things that had to happen to get us there. As you said, Trump did not win the popular vote but was installed by the rules of the electoral college. You have the Senate with its two senators per state rule being one of the handful of provisions of the constitution that are actually described on their own terms as being non-amendable. It’s not clear what that would mean if we tried to amend it, but disproportionate representation is very deep in the document. And then you have the fact that this very significant branch of government has in effect the final word over some of the most consequential issues, and the ones that are closest to our feelings and identities, is not only produced by this two-layer undemocratic process but is also staffed by people who graduated almost exclusively from two or three graduate schools. The Supreme Court is like a House of Lords for our meritocrats from Harvard, Yale, and sometimes Stanford law schools. Let’s talk about Kavanaugh’s widely viewed Senate hearing. Leaving aside his ruling history — and the threat he poses to women’s reproductive rights and to workers’ collective bargaining rights, etc. — more than half of the American people don’t trust this guy because of the recent sexual assault allegations and their fallout. I’d venture that most Americans who are tuned in find Ford’s allegation and her testimony credible: not necessarily incontrovertible, but credible. Millions of people either believe or strongly suspect that Kavanaugh is guilty of sexual assault and of lying about it under oath. And there have been plenty of articles about the other little things he lied about, perjuring himself in the process of defending himself from the sexual assault allegations. In short, he’s untrustworthy — and distrusted on a massive scale. What are the implications of that? Would his confirmation create a popular crisis of legitimacy for the Supreme Court? I’ve been wondering about this as well. Everything you say seems true to me, including the suggestion at the end that if this guy goes on the Supreme Court, the mistrust and the sense of being affronted and insulted by the process will follow him. I think there’s a pretty straightforward, legal proceduralist kind of argument to be made that it could not possibly be appropriate to give someone a lifetime appointment in the face of credible claims like this, without a much more serious investigation than it looks like it’s going to get. That argument would hinge on an assumption about the Supreme Court being nonpolitical, an institution that claims general neutrality or the right to speak on behalf of the whole country or some formulation like that. But I am of two minds about that argument. Because the Supreme Court is not and has never been a nonpolitical body that can be said to speak in a neutral way or for the whole country. It’s very clear that the reason Republicans are trying to push Kavanaugh through is in good part because controlling the courts is one thing the Republican Party understands it can do to preserve political power. If the other democracy-defeating features of the arrangement begin to break down, resulting in the Republicans becoming a long-term minority party, which is certainly plausible, they can hold the courts for another twenty years or more if they get enough of their people in. The calculation that the major decision-makers involved are making is really about the Supreme Court as a political body. And so, I think the following: there are good tactical and principled reasons to say that under these circumstances, someone who believes in courts qua courts should not want this confirmation to go through. But there is a more basic reason for progressives to oppose Kavanaugh — and it’s not to take anything away from the seriousness of a reckoning about sexual assault, both for him and in the broader culture — which is that even if he were everything he says he is, the political stakes are incredibly high for progressives. Any argument about the Supreme Court that doesn’t come to grips with the way that it is a political body is only dealing with half of the reality. I’ve seen what’s been happening as the intersection of two developments. One is the reckoning with forms of sexual predation that have been aggressively protected for too long. And then, second, we have a crumbling of the court’s claims to neutrality of impartiality. I think the first of those is a clear and essential gain, and the second is complicated and carries risks, but it is also an important democratic reckoning to have. I think you’re right about the long-term political strategy of the Republican Party, but I think that doesn’t completely explain why they’re pushing so hard for him, and how. There’s something less calculated and more emotional going on here. Isn’t there also a cultural dimension to the GOP’s general refusal to give Kavanaugh the boot? Does this have to do with resistance to #MeToo from men and even women who think the movement has gone too far? Or is loyalty to Kavanaugh an act of protest from well-heeled, well-educated political elites who feel Kavanaugh deserves to attain the success that’s been promised to him? It’s been observed, and I think it’s real and revealing, that a lot of right-wing punditry chatter around Kavanaugh doesn’t adopt the view that he’s telling the truth, but instead that if he’s lying, his actions are excusable. I think there’s come to be a huge emotional investment in this by men who feel their positions threatened by the #MeToo movement. There is also a fierce sense in Kavanaugh’s cohort, just as you put it, that he’s earned this, and that for it to be taken away from him now would be a kind of lawless mob action — rather than a democratic response to an anti-democratic strategic move on the part of Republicans. When Kavanaugh was before the Senate, his sense of self-justifying meritocratic entitlement was evident. It was extraordinary to watch him answer questions about how he’s treated people by talking about how hard he had worked and the things he had earned at the very best schools and so on. It speaks to the deeply meritocratic, which is to say elitist, sensibility of that world. The second thing that was very striking to me in that regard was this phrase he used, complaining of “millions of dollars from outside left-wing groups” involved in bringing forth Ford’s allegation. Outside was a key word, and I thought immediately, outside of what? I think he means the eruption of politics, of political advocacy, into what was supposed to be a kind of insider decision. I don’t think it was a self-conscious dog whistle, I think it was a genuine expression of his sense of the geography of political and judicial decision-making — that there is a responsible inside professional space where these things are supposed to be worked out and where he’s spent his life, and then there’s the outside. Of course, the right-wing advocacy groups are around, they know they have a stake. But the left-wing unwashed “outside” is not supposed to show up. How about the Democrats — what tack are they taking? Is it strong enough? And maybe more to the point, is it political enough? The Democrats seem to be relying on advocacy groups to get out the word about Kavanaugh’s impact on contentious political issues like reproductive rights. Meanwhile they themselves are primarily concerned with searching for a rationale to block Kavanaugh that looks semi-neutral, or less partisan and less political than going straight to the stakes of the issues that he’s going to be deciding. In part that has to do with securing votes from Republicans and red-state Democrats, which they need to if they’re going to block Kavanaugh. But it also has to do with this weird, basically incoherent and certainly unsatisfactory legitimating discourse around constitutional jurisprudence, which holds it up to be something ideally neutral and transcendent, which is compromised whenever politics is injected into it. Both parties reflexively fall back on different versions of this. Republicans tend to fall on originalism — somehow they still own the “judicial activism” phrase. Democrats meanwhile point out all of Kavanaugh’s right-wing affiliations, which is not wrong by itself, but it always comes across as implying that the problem is that our transcendental institution is getting corrupted with politics. And that is wrong. It runs away from the real stakes. And I think it also makes the Democratic Party less likely to do what I would hope both left Democrats and activist groups — including maybe Democratic Socialists of America groups that are inclined to it — would do, which is to advocate openly for a progressive view of what we ought to do with the constitution and the courts, and to understand that as an appropriate goal for any group that wants to contest power in the US. You wrote in an article that this week, the answer to the politicization of the courts is “not de-politicization but counter-politicization.” What did you mean by that? The recognition that the courts are political, and that fights over the basic direction of institutions and the distribution of power in the country will always tend to involve the courts, is really perennial. We’re in a somewhat odd period right now, the end of a long hangover from mid-century consensus Cold War liberalism. But when you look at the history of how reformers and radicals and critics have talked about the courts, you see decade after decade of people coming after the Supreme Court, usually for its defense of economic royalists and monopolists and other kinds of concentrated power, going back all the way to its support of the slavocracy in the antebellum period. This gives me a thread of optimism that we can dispense with the anxious small-c conservative idea that once we let politics into this thing the next stop on the train is anarchy. Actually, there are a lot of resources for new forms of legitimacy in movements that can actually align the court with majoritarian currents. The thing I’ve been arguing is that people on the Left ought to think about the ways that the courts can do specific jurisprudential work that’s linked to the major developments in mobilization and thinking on the Left. The cluster of issues that I’ve pointed to, more to start the conversation than to finish it, are, for one, very strong defense of ballot access rooted in general constitutional principles of majority self-rule and self-rule by equals. There is a whole raft of new efforts to maintain minority rule, from voter suppression laws to felon disenfranchisement. Progressive reformers might look to the courts to roll back those efforts. The second thing is to recover a real sensitivity to the role of economic power in structuring all relations that happen within the law, and to look for opportunities to correct or mitigate it — and to assume that legislation that attempts to mitigate the arbitrary power of economic elites is presumptively constitutional. That would mean things like looking very skeptically at private arbitration agreements, and it would mean presuming that laws serving to facilitate collective bargaining are constitutional because unions are in themselves a key feature of a democratic society in a complex economy. And it would mean attending to campaign finance policy, insisting that you have to have structures to control the translation of economic power into political power. The third is to revive and deepen engagement with criminal justice reform, pressing specifically on racialized incarceration and regimes like money bail. And the fourth is to pay special attention to the vulnerability of noncitizens, who are exposed to a weak form of due process and all kinds of state terror. What courts do that majoritarian movements sometimes have trouble doing includes extending a consistent set of principles into many different nooks and crannies of administrative and institutional life. Majoritarian politics gives it the energy, but there’s a lot of capillary consistency-making that courts do. They can also play a powerful role in co-articulating the principles of majoritarian movements, particularly the conceptions of equality and liberty and democracy that they’re advocating. And I think probably the most important thing they can do is secure the commitments of a majoritarian movement on behalf of populations that tend to lose out, even with majoritarian allies — the people who are the most marginal and vulnerable. I’m sold on this political approach to the courts, but it’s not going to bear immediate fruit in the Supreme Court if Kavanaugh or someone else from the Federalist Society is confirmed. And some of these issues are very urgent and consequential. Did I read correctly that Abraham Lincoln grew the Supreme Court to ten justices in order to secure support for his policies? And didn’t Franklin D. Roosevelt have a similar plan that never came to pass? If so, is that the practical answer if Kavanaugh gets confirmed — to add more justices, with different political commitments? I think that some kind of reform of the whole institution, to make it less erratic and less aristocratic, is desirable even if we abstract from the present crisis. There are many different ideas for reform. One that I think is achievable and potentially stabilizing is to restrict the court to eighteen-year terms and put one new person on every two years, with the result that you would have a very consistent feedback relationship between presidential majorities and the profile of nominees. It’s less of a big bang than Roosevelt’s proposal to grow the court, or what Lincoln did. But the advantage of doing it would be in the long-term, that it might be a more stable solution than the court’s majority swinging one way or the other for long periods. Generally, there is a really good case to be made for denaturalizing and desacralizing the current form of the court, in part to show in a very concrete way that it is an institution of democratic governance like all the others. There would be something positive about changing its form, just to show that it can be done. There are good cases to be made for suggestions ranging from packing the court to term limits and regular replacements. What I want to insist on is that if the current Democratic Party moves to do this, I think it will be mostly defensive in its motivation. I would want everyone on the Left to be pushing for reform in order to pursue the progressive constitutional jurisprudence that we’re talking about. However the institution ends up getting reformed, and I think there’s a nontrivial chance it will get reformed, I would want us to be pressing to make the political stakes of that explicit. We shouldn’t be seeking to restore our transcendental neutral constitution — we should be building a more progressive institution for a more progressive constitutional program.